Preheat broiler. In a medium bowl whisk together eggs, salt, and crushed red pepper. Heat olive oil in a 10-inch oven-going skillet over medium-high heat. Layer zucchini slices on bottom of skillet in an even layer. Cook for 3 minutes, turning once. Top with cherry tomatoes. Pour egg mixture over vegetables in skillet. Top with mozzarella balls and walnuts. Cook over medium heat for 4 to 5 minutes or until sides begin to set, lifting with a spatula to allow the uncooked portion to run underneath. Broil 4 inches from the heat for 2 to 3 minutes more or until set. Cut into wedges to serve. 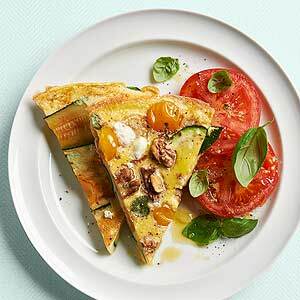 Serving Suggestions: Serve with tomatoes slices and basil leaves and drizzle with additional olive oil.